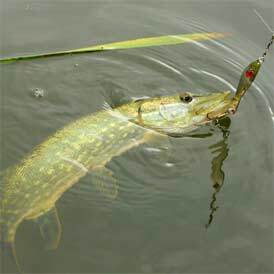 All about fishing for northern pike and tiger muskie in Idaho. This state offers unique fishing opportunities. Listed below find information about these species of fish, found in Idaho waters. Larger lakes across the state of Idaho, with some of these miscellaneous fish populations, may include Anderson Ranch Reservoir, Arrowrock Reservoir, Blackfoot Reservoir, Brownlee Reservoir, C J Strike Reservoir, Cascade Reservoir, Coeur D'Alene Lake, Hayden Lake, Hells Canyon Reservoir, Lake Lowell, Lake Pend Oreille, Lake Walcott, Lucky Peak Reservoir, Magic Reservoir, Mormon Reservoir, Mud Lake, Paddock Valley Reservoir, Priest Lake, Ririe Reservoir or Salmon Falls Creek Reservoir. Many of the species we portray as "other" in this website are simply not as commonly fished for as the more popular fish. For insight into some of these "other" fish in Idaho, visit the other fishing page for more in-depth information. Best fishing lakes in Idaho!